Bellingham, WA, August 14, 2015. 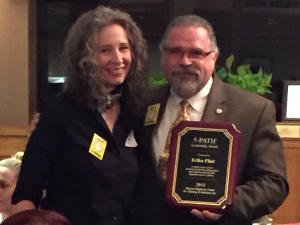 -- Local Board Certified Hypnotist, Erika Flint was awarded the 5-PATH® Hypnosis Leadership award for 2015. The annual award was presented by Calvin D. Banyan, CEO of the Banyan Hypnosis Center for Training & Services (Tustin, CA, hypnosiscenter.com) during the National Guild of Hypnotist's (ngh.net) annual Conference held in Marlborough, Massachusetts August 9-11, 2015. "I'm honored and delighted to be recognized with the 5-PATH® hypnosis leadership award " said Erika Flint, President of Cascade Hypnosis Center. Erika Flint is a Board Certified Hypnotist with the National Guild of Hypnotists, a Certified Professional Hypnotherapy Instructor, and she also writes for the 5-PATH ® journal and is a co-host on the popular hypnosis educational program Hypnosis, Etc. To contact Erika Flint, call 360-392-8723 and/or email erika@CascadeHypnosisCenter.com.